The 2018 Gulf of Mexico Regional Sea Grant Meeting will be held at the Dauphin Island Sea Lab, 101 Bienville Boulevard, Dauphin Island, Alabama, on Nov. 14-16, 2018, Wednesday (half day), Thursday (all day), and Friday (half day). Facilitate networking across the four Gulf of Mexico Sea Grant programs. Learn about regional activities being conducted by Sea Grant colleagues working on similar issues. Develop strategies for Sea Grant staff to jointly work together on regional topics. Begin to capture regional success stories. Increase understanding of emerging and long-standing regional issues. There is no registration fee for staff that work for the four Gulf of Mexico Sea Grant College Programs. A registration link will be added closer to the meeting date. 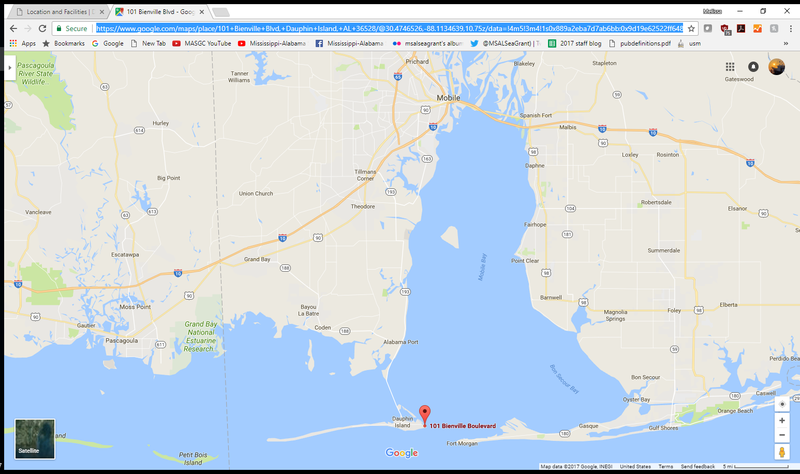 The Dauphin Island Sea Lab is located on the eastern end of Dauphin Island, a 17-mile- long barrier island approximately 3 miles from the mainland and 35 miles south of Mobile, Alabama. It is surrounded by Mobile Bay, Mississippi Sound and the Gulf of Mexico. The 35-acre campus is bordered by Mobile Bay to the north and the Gulf of Mexico to the south. The agenda has not yet been set for the November meeting. Overnight accommodations will be available in the Dauphin Island Sea Lab’s dormitory facilities. These single or double-occupancy dorm rooms have recently been updated and feature two twin beds, a dresser, desk, closet space, a single unit air-conditioner and handicapped-accessible community bathrooms. Wifi will be available upon registration. Linens are not provided but are available upon request. For more information, please go to http://www.disl.org/about/location-facilities. The Dauphin Island Sea Lab is a great place to get away and focus on the task at hand! Surrounded by Mobile Bay, the Mississippi Sound and the Gulf of Mexico, the 35-acre campus sits on the east end of Dauphin Island, a town not known for its night life. While Dauphin Island lacks a full-service grocery store and fast food places, it offers several restaurants and great outdoor opportunities such as fishing, beachcombing, kayaking and bird watching along with great sunsets and typically clear evening skies for stargazing. Due to a limited budget, we encourage participants to drive and carpool. Dauphin Island Sea Lab is located at 101 Bienville Blvd., Dauphin Island, AL 36528. Dauphin Island lies approximately 45 minutes south of Mobile, Alabama. The most convenient access is via I-10, exiting at 17A (Rangeline Road), driving south approximately 5 miles, jogging left (east) when that road ends at the Chevron station for ~1 mile, turning right on Hwy 193 (Dauphin Island Parkway) and continuing south to the island. Coming from the west, a slower, but perhaps more scenic route is via Hwy 188, exiting I-10 at Grand Bay and following 188 until it meets 193 just north of the island. Once on the island (watch out for our speed patrols), turn left (east) at the first stop sign/water tower and drive ~2 miles to the Lab (just past the ferry dock and campground). Note that the speed limit drops drastically as you get close to the ferry dock. Park either in the lot immediately east of the dorms, or north (towards the road) of the Beagle dorm. Here are the meeting notes from previous Gulf of Mexico Regional Sea Grant Meetings. The regional meeting is sponsored by the Gulf of Mexico Research Initiative and the Sea Grant Programs in the Gulf of Mexico.